When deciding the choice of napkins for your wedding, let's first state the obvious: Paper is cheaper. If you are on a budget, then there is no shame in making this choice. However, if your priority lies in making more of an impact, perhaps linen is right for you. The sight of folded linen napkins adorning your guests' tables evokes a since of a formal affair. A night to be remembered. Though you can spend a lot less on paper napkins, price could rise quickly if you choose more than just a plain napkin. If you go to the printed route, for example, the costs may be nearly competitive with linen rental. Plain white paper napkins can be found for less than $.05 each but the cost rises as extras are added. When embossed or printed they can easily cost as much as $.30 to $.50 each. At that point they become comparable in price to linen rentals. Paper napkins can be a colorful addition to your décor. When personalized, they can be even more formal. 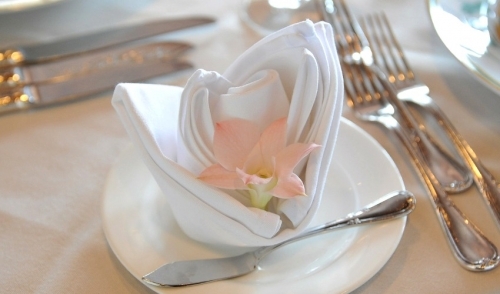 Lined napkins are larger and heavier and as such, are more easily folded into various shapes, creating unique, elegant table designs. In short, paper evokes the feeling of a party. With linen, it’s an event. The convenience of paper is clear. Easy clean up, no problem. However, paper tends to leave a sense of clutter just by its disposable nature. You might say the same thing for paper plates and cups. In fact, if you’ve already committed yourself to using dinnerware that needs to be collected and washed, it is not much more trouble to do the same with linen tablecloths and napkins. If the environmental impact is an issue, the re-usable nature of linen is the obvious, greener choice. While the disposable route may seem cheaper in the short term, there is another consideration that is much more long lasting: Your wedding photos. The extra expense towards elegance can be preserved in your wedding album for the rest of your lives together.